We are dedicated to offer an array of specialized, premium, reasonable and industrially updated software development services in Jaipur. Based on vast industrial experience, we have a record of working with the best available technologies while keeping in mind existing trends and future potential. ASP IT SOLUTIONS helps to transport projects that escalate business, overthrow expenses, add to the overall level of yield and offer a lead to clients in terms of a competitive edge. Our enduring experience in the field of software solutions in Jaipur has made us competent in managing every phase in software development life cycle. Our consistent growth witnesses our client’s trust in us thus making us mature and more confident in the future projects we undertake. Beginning from preliminary planning, setting up configuration, systems integration and operation, all your software solution requirements can be met by our software development company in Jaipur in a proficient and competent approach. 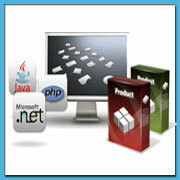 To get a cost-effective software development quotation, please email us at [email protected].